Cello Renda (Left) in action against Max Maxwell. 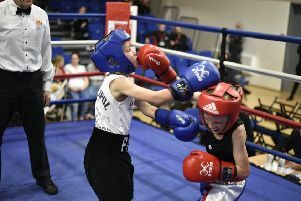 Cello Renda is closing in on a crack at the British middleweight championship. The 30 year-old from Peterborough has been matched with Jack Arnfield in a British-title eliminator and the 10-round fight goes ahead in Preston on Saturday, October 3. Renda is also hoping he may get a crack at the Lonsdale Belt without facing Arnfield. He made contact with British champion Nick ‘Bang Bang’ Blackwell on Twitter last month and said: “Nick seems keen on the fight and he’s put it to his promoter (Mick Hennessy), but I haven’t had a definite yes or no yet. Renda went into the three-round fight in Blackpool with a broken bone on his left hand that’s kept him out of the ring since, but fought through the pain barrier to throw non-stop punches and hand Arnfield his first loss on a deserved split points decision. Renda, who was beaten in the final by Tom Doran, said: “I’ve beaten him with one hand and now I’ve got two, I’m sure I’m going to do it again. “Last time we fought, I broke his heart. Jack said that he couldn’t keep me off him and this time, I’m going to keep him under pressure for 10 rounds with two hands. “I beat him last time when I couldn’t use my left hand. I didn’t have my jab as a weapon and range finder and next time I will. Arnfield will have home advantage - he’s from Blackpool - but Renda expects to take good support with him and added: “I’ve stayed in the gym since my last fight and have only got a stone to lose. For me, that’s ideal. I can lose a couple of pounds a week.